Jesus said that the Day of the Lord will come upon earth like "a thief in the night" (Rev.16:15) That means that only "they who stay awake and remain clothed" will have some warning that AT LAST(!) He is on His way. Oh Yes, make no mistake, there will be MANY scoffers. The Apostle Peter warned about them: "Above all, you must understand that in the last days scoffers will come... They will say, “Where is this ‘coming’ he promised?” (2 Pet.3:3-4) However, I am not discouraged by mockers. I will do what the Lord has urged me to do: Warn His Gospel Children of the coming dreadful day of Great Tribulation. I know that the Elect will heed the warning. NO, I am not going to be so arrogant as to predict the "day and hour" of the Great Tribulation. Jesus said that info is out of bounds for any human, even the "Son"! (Mat.24:36) I will focus on what I can do: Bring the world's attention to the fact that the time is at hand. So, let's get down to the business of explaining the sign. I'll get to the point of what the sign is. By the time I've posted this article it would already have come to pass. The sign is the total eclipse of the sun that will move over the breadth of the USA on August 21, 2017. So, let us get on with it and put the puzzle together. This info is vital in unlocking the key to the secret of the end of the current world order. Please share this article as far and wide as possible. Let the Elect know that God is about to interfere in world affairs in a direct way. This is the physical part of the prophesy. This part refers to the total solar eclipse. Now many people will argue that total solar eclipses may be rare, but it happened many times after the year 30 AD, when Jesus made these prophesies about His Return. Yes, that is so, but there are other factors which make this time the Real McCoy. 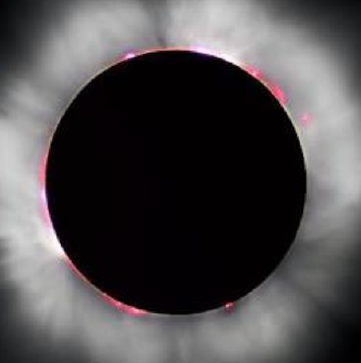 It is the first and only time that a total eclipse will be coupled to the month of Elul on the Jewish calendar, as well as the month of Hajj on the Islam calendar, since Jesus ascended to heaven! THE MOON WILL TURN TO BLOOD. Now this has nothing to do with the physical eclipse that can be explained in the finest detail by science. This "moon that turns to blood" has a spiritual meaning. The calendars and holy days of two religions of the Book, namely Judaism and Islam, are both ruled by the moon. Now this eclipse occurs on the time of the new moon that indicates two very important holy months in Islam and Judaism. We know the towers already fell on 9/11, 2001, but that's a different prophecy, yet inextricably coupled to the "blood" in the New Moon of Hajj. The time has now come for the "great slaughter" which come to pass on Eid-Ul-Adha, indicated by the eclipse of the Islam 12th month. So, the "moon turning into blood" is an allusion to the Korban that takes place in Islam during Hajj which is an exercise of making penitence for sin. In Judaism the eclipse indicates the sixth month called Elul, which is the month of penitence for the "High Holy Days" of Tishri, the 7th month on their calendar. Like Historical Israel was taught, penitence was a step in the right direction, but without blood, there was no redemption for sins. This is another independent indicator of the moon turning into blood. Thus, the Month of Elul 2017, announce: "The King is in the field. Are you?" 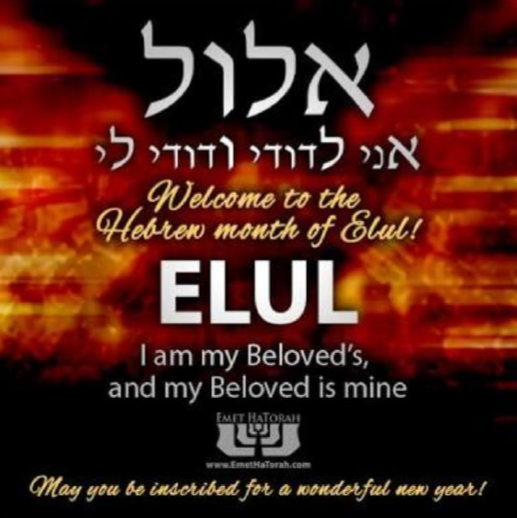 Elul is the month when every Jew prepares for Rosh Hashanah and Yom Kippur of the seventh month, in which they will also celebrate the Exodus during the Feast of Booths. So, there you have it. What you do with this info is up to you. You can mock me or just ignore this article, or you can also think about the direction your life is going and perhaps consider a U-turn of penitence. 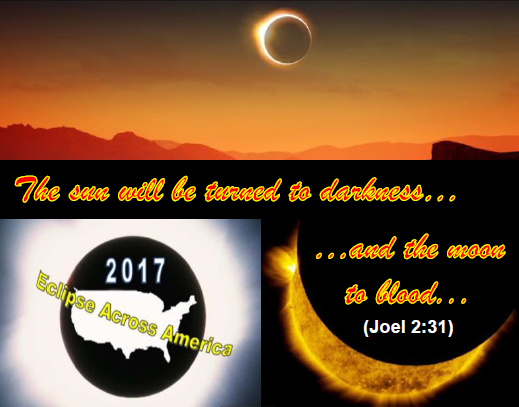 When all the excitement of the eclipse has gone, keep your ear to the ground, because the King will very soon come out of the field and "stand in the holy place". Then it will be time to "flee to the mountains" as Jesus advised in Mat.24: 15-16.